Each member of ILAS was e-mailed an individual username and password and instructions for electronic voting on or about November 17, and voting was opened. If you have not yet voted, you may vote any time until January 16, 2015. If you did not receive an e-mail and wish to vote, please verify that you are a 2014 member (remember, receiving ILAS-net messages does not imply you are an ILAS member). You can determine whether or not you are a 2014 member of ILAS (as of Nov. 15, 2014) by consulting the website: http://www.ilasic.org/misc/membership.html. If you are a member and did not receive an e-mail, please contact Leslie Hogben hogben@aimath.org, ILAS Secretary Treasurer, to obtain your username and password. We are pleased to announce the 6th de Brún Workshop: Linear Algebra and Matrix Theory: connections, applications and computations to be held at NUI Galway, 3-7 December, 2012. The aim of the workshop is to bring together mathematicians with interests in various aspects of linear algebra and matrix theory, and their connections with other areas of pure and applied research. Charles Johnson (William & Mary). There will also be a programme of contributed 30 minute research presentations. Graduate students are particularly encouraged to attend and participate. This workshop will be hosted by the de Brún Centre at NUI Galway, and is supported by Science Foundation Ireland. The deadline for registration is November 1. Registration is free. Travel, food and accommodation are at the expense of participants. The de Brún Centre may be able to fund accommodation for some graduate students. The workshop will be followed on Dec 8th by the inaugural Irish Meeting for Linear Algebra Research. In June, the software to manage the ILAS-Net mailing list was changed from majordomo to mailman. There have been some bugs in subscribing to and unsubscribing from the email list. These have been worked out. 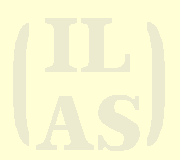 The webpage on ILAS-IC has been updated to reflect the changes. A password will be automatically assigned to you. You can access this password by selecting the Password Reminder button on this page. If the message acceptable, it will be sent out on ILAS-Net. Thank you for your patience with these changes. Copyright © 2010 International Linear Algebra Society. Made by Sang-Gu Lee e.t.a.l. All rights reserved and see our disclaimer for fair use.